WASHINGTON (Reuters) - The World Bank's executive board unanimously approved David Malpass, the U.S. Treasury Department's top diplomat, as the bank's next president, continuing the 73-year tradition of an American leading the development lender. The bank said that Malpass, the Treasury's undersecretary for international affairs, will start his new role on Tuesday as the World Bank and International Monetary Fund Spring Meetings get underway. 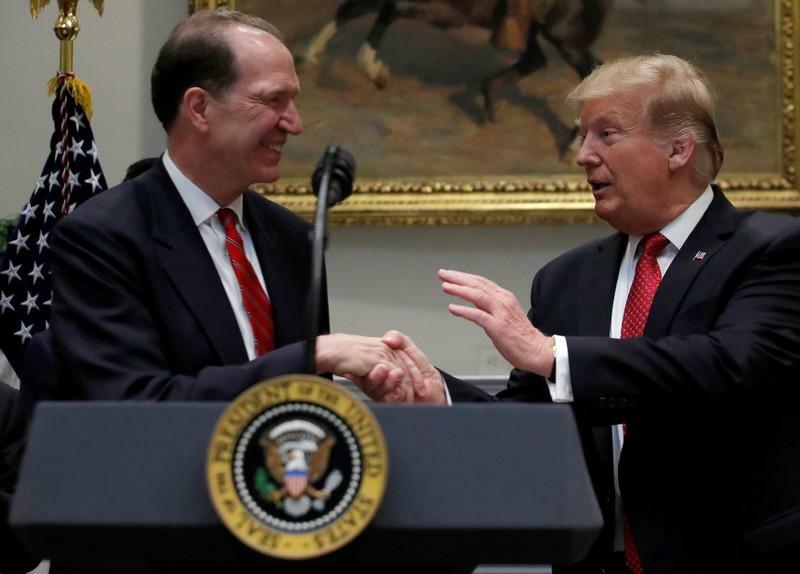 Malpass, a former Bear Stearns and Co chief economist who advised U.S. President Donald Trump's 2016 election campaign, was the sole candidate for the job. Previous World Bank President Jim Yong Kim faced two challengers, from Nigeria and Colombia, in 2012 when he was first selected. In a phone interview with Reuters, Malpass said he would uphold the bank's commitment to reducing poverty in the poorest countries and to fight climate change, and pursue goals stated in a $13 billion capital increase last year. Since taking his job at the Treasury in 2017, Malpass had been particularly critical of the World Bank's continued lending to China, arguing that the world's second-largest economy was too wealthy for such aid while it was loading up some countries with unsustainable debt from its Belt and Road infrastructure program. Those comments and Malpass' role in U.S.-China trade negotiations caused some concern in the development community that he might try to use the bank's influence to put pressure on China. But Malpass said he saw an "evolution" of the bank's relationship with China "toward one which recognizes China as the world's second-biggest economy and an important factor in global development. I expect there to be a strong relationship collaboration with China. We have a shared mission of poverty alleviation and reduction." Malpass said he did not participate in this week's U.S.-China trade talks and is winding down his role at the Treasury. He said he intends to make his first trip as World Bank president in late April to Africa, which has been a primary focus for the bank's development efforts.